A great habitat, the correct foods, and proper care go a long way in keeping a hedgehog healthy. Unfortunately, even with the best care injuries or illness may occur. If your pet becomes ill, it is always recommended that you seek advice from a veterinarian. Below are some of the common injuries and illnesses that effect hedgehogs. Cancer is a fairly common disease that affects hedgehogs. A hedgehog may get cancer in any part of its body. Cancer symptoms can be a tumor or resemble a different illness. Signs of ear infection include wax buildup and flaky or crusty ears. Ear problems are often caused by mites or fungus. A hedgehog’s eye may appear cloudy, swollen, or bulgy. This can be caused by the eye being accidentally poked or scraped. It can also be a symptom of another illness. A hedgehog may have bloody or swollen feet. This may be caused by his feet being rubbed raw on a surface that is rough or abrasive. Check his cage for items that would be rough on his feet. Wire exercise wheels are often the culprit. Solid wheels are safer for your pet. Bloody feet may also be caused by a ripped or torn nail. Blood loss can be stopped with a styptic pencil, flour, or corn starch. Keeping your pet’s nails trimmed and removing items that may snag his nails are the best way to prevent injury. Hedgehogs can be infected with fleas and ticks just like dogs and cats. Symptoms can be redness, a rash, and excessive itching or scratching. When a hedgehog foams at the mouth it is completely normal. It is often triggered by strange or unusual smells. A hedgehog may chew on a new smelling item until it has a foam of saliva around its mouth. The hedgehog may then smear and lick the foam all over its sides and quills. Although hedgehogs naturally hibernate in the wild, your pet should not be allowed to hibernate. Hibernation can be dangerous for your pet and sometimes even fatal. The easiest way to prevent it is to not let his cage get too cool. A hedgehog may get a bloody nose from scraping or rubbing it against a sharp or rough object. Although a nose may bleed profusely, once you get the bleeding to stop it will often heal quickly. A styptic pencil and household items like flour or corn starch can all aid in stopping blood loss. Hedgehogs will eat a variety of items and sometimes an item is not food. The item can get lodged in the stomach or intestines and be potentially fatal. Symptoms can be lethargy, loss of appetite, vomiting, or coma. 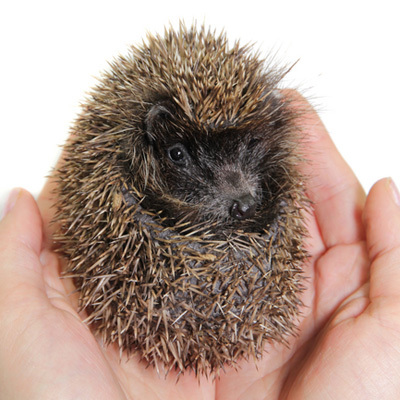 Respiratory infection is often caused by a hedgehog’s home being too cold. Symptoms can be loss of appetite, lethargy and heavy or noisy breathing. Hedgehogs may get a skin disease often caused by mites. Symptoms include hair or quill loss, flaky or dry skin, scabs, redness, and excessive itching. Hedgehogs can have tooth and gum disease. Symptoms can be loss of appetite, drooling, bad breath, and red or swollen gums. Providing dry crunchy food as the primary part of your pet’s diet is the best way to prevent the disease. Young hedgehogs do lose their baby teeth so there is no need to worry. Hedgehogs may also lose teeth in their later years. You may need to supply an elderly pet softer or smaller foods that are easier to eat.